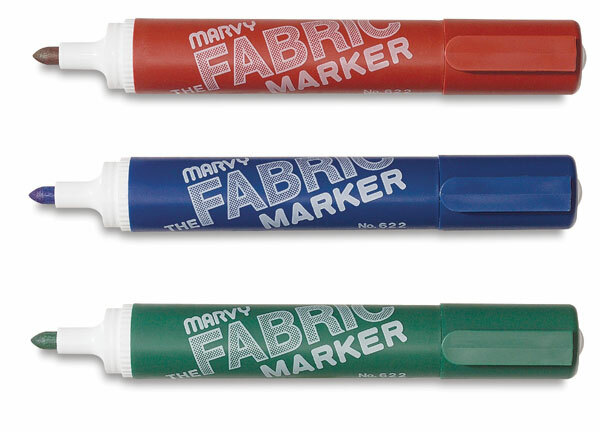 The Marvy Fabric Marker is a giant size marker (5" long) with a bullet-shaped tip that can mark, draw, and write on any fabric. This non-toxic, permanent color dries instantly — no steaming or ironing is needed. 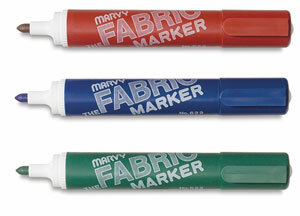 Designs made with Marvy Fabric Markers never fade, even if the fabric is washed or dry cleaned. The fade-resistant color will not stiffen, and leaves no mess. Set of 6 Markers — A set of six colors, including Black, Red, Blue, Green, Brown, and Yellow.